I do not enjoy travel books. I never have. May be it is because I am envious that I wasn’t there while the author was enjoying and making the most of a new city in a new country or it is because I so want to be there that I’d rather be there than read about it. I enjoy travelling more than reading about it. 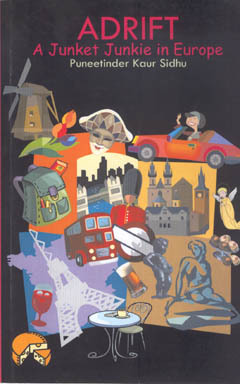 I always thought I would not enjoy a travelogue till Blogadda.com sent me a copy of, “Adrift – A Junket Junkie in Europe” – written by Puneetinder Kaur Sidhu. Adrift thankfully is not your usual Eat, Pray, Love travel kind of book. It is genuinely different and how so you may ask? First it is a book only of 106 pages and that is great for any reader who wants to read a travelogue – because the author is not giving away much and yet at the same time enough has been written to evoke interest. Adrift is one summer in the author’s life in Europe – its sights, smells, tastes, sounds and enriching experiences. She has described almost everything – the airport, the places she stayed at, the houses, the scenes from the houses and most importantly the cities she visited. I loved the structure of the book – from the journey to the end of it – the places you visit with the author as you go along – Germany, Sweden, Denmark, Netherlands, Hungary, Austria, France, and Great Britain. Puneetinder does not let her writing get too sentimental or too pedantic at any point. The style is easy going and would appeal to almost any reader, even the one who does not like reading the travel genre. The writing keeps things simple – it does not tend to confuse the reader. Moreover the pictures in the book spread across eight pages only spreads a smile across the reader’s face. Adrift makes you believe that even you can actually take off and visit Europe the way the author did. Her description is breathtaking in the sense that you just want to take off and visit those places. Every place is meticulously described and the good thing is that it doesn’t end up being a Lonely Planet Guide. Puneetinder keeps in mind about the pace and content of the book. What I also liked was that before every chapter there was a quote mentioned by a famous author – from Steinbeck to St. Augustine to Dorothy Parker. Adrift is one of those books that you want to curl-up with. It isn’t preachy. It isn’t boring. It isn’t what you think it will be. Adrift is a book that will keep you company as you are waiting in a lobby of a hotel to meet someone or at a cafe and trust me: You will daydream about the places as you read. This entry was posted in Books, Non Fiction, Review and tagged Adrift, Books, Europe, Lead Start Press, Non-fiction, Puneetinder Kaur Sidhu, travel on September 28, 2011 by thehungryreader. Let me make you aware right at the outset: The Red Market is not going to be an easy read. If you are looking for something nice and warm and mushy, then don’t even pick it up, however if you want to know reality and what goes unnoticed and unseen, then this is the book you must read. Through ten detailed, sometimes nauseating chapters (trust me at one point I thought I would throw up), Scott Carney removes the mask from the many layers of exploitation, experimentation, harvesting, and piecemeal selling of humans and human organs. Targeted subjects include: the organ harvesting of corpses; the selling of kidneys and lungs and the thin red line of social acceptance it has reached in certain provinces in India; the kidnapping and subsequent cross-continental adoption of children from third world nations; the pharmaceutical practice of using willing human guinea pigs to test potentially dangerous new medicines; and even the growing market for real human hair. I was astounded on reading some of the chapters. To know what takes place behind the curtain is discomforting for sure, however this kind of education is much needed. Carney an investigative reporter is allowed that insider’s perspective into the on-goings of the market of organ trafficking and selling. The book is full of individuals whose lives have literally been taken from them – who have been coerced into selling their blood (drained almost), women and men who owing to circumstances have no choice but to sell their kidneys and other body organs, of parents whose child is taken away from them (in the name of adoption) and settled in America, only to be abused for work. The writing is frank and not for once does Carney mince his words. He tells it the way it is even if it means that readers have to squirm at the thought of it. It is not easy to take note that even during the age of globalization and policies and procedures, there are brokers who are adept at finding loop holes in the system – from selling of organs to surrogate pregnancies to stealing babies. Carney also takes a close look at the underlying issues – the anonymity in organ donation (which works best for the middlemen), the nature of fluctuating demand where growing technology is concerned and the relationship between the free market and the individual’s choice or the lack of it. Carney writes in first-person, making you feel that you are right there as the events unfold. The reading is not difficult – it is simply written. Just that I had to pause several times while reading it, so I could move on with it, considering the topic. Scott Carney has done an outstanding job with this book. He has unearthed the darker side of humanity and the extent to which human beings reach the bottom-most level. He asks difficult questions for which there are no answers. The Red Market is a gripping account of an invisible crime wave that lurks between us and wings itself in every medical breakthrough. It will make you wonder and think a lot about the issue on hand, probably not the way that you would have earlier. This entry was posted in Books, Hachette Book Group, hachette india, Non Fiction, Review and tagged Blood Farmers, Bone Thieves, Non-fiction, Organ Brokers, Scott Carney, The Red Market, Trafficking on September 27, 2011 by thehungryreader. Anuvab Pal is one of the wittiest writers I have read in a while. I would not classify his writing as necessarily funny. His writing style is more sarcastic and satirical than anything else. He writes about India – today’s India and what it means to its citizens and how outsiders view it. I remember watching his play, “The President is Coming” with much trepidation – as he wasn’t a known playwright back then. I also recall enjoying the play a lot and then also watching the movie with the same enthusiasm. As I read his new book, “1888 Dial India” I was certain that I would read more by him in the future. 1888 Dial India is a book about new India and its follies. It is about the illusions it is creating and how people are emerging to be a part of the consumerist culture that is taking over half the country. The year is 2009. America is in a financial mess. Unemployment is in the air and doesn’t seem to go away easy. Enter: Arun Kumar: Entrepreneur, pragmatism personified, evangelist of new India’s dreams and under the impression that he can outsource the saving of American lives to India as well. That is the crux of the book, however there is more to the surface than what meets the eye. Anuvab’s eye to detail is brilliant – the nuances of everyday living are skilfully displayed – from the BPO culture to the merging of India’s past, present and future perceptions. Corporate culture is most certainly written about a lot, however not in the usual boring tie and meetings affair – Pal’s writing comes from observation and there are so many instances that I could relate to having worked in that environment for most of my professional life to date. I enjoyed reading the book more so because of the writing style. It is well-paced and it is at times in your face, however that is where the humour stems from, so one can overlook it. The writing nonetheless is crisp and to the point. It does not at any point get preachy, which is how ideally one should write when talking about current issues. 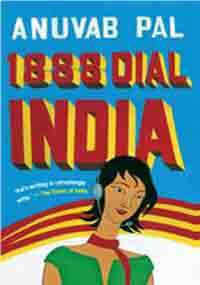 For me reading 1888 Dial India was a welcome change from the usual literary fare. It was something that happened by chance and I will re-read it for a laugh or two. It is definitely a perfect read for one of those lazy Sunday afternoons. This entry was posted in Books, Fiction, indian fiction, Random House India, Review and tagged 1888 Dial India, Anuvab Pal, BPO, Call Centre, Fiction, India, random house india on September 26, 2011 by thehungryreader. There is only one Indian living writer I know who still manages to evoke my childhood memories that either seem long time gone or buried for good. That writer is Mr. Ruskin Bond. Though his stories are primarily set in Dehradoon, everyone who reads them can successfully conjure the picturesque beauty in his or her mind and that is the power of good writing. My stint with Mr. Bond’s works began when I was all of sixteen and it wasn’t with his most acclaimed The Room on the Roof. It was with “A Flight of Pigeons” and it is but obvious that I fell in love with it, though it is one of his more serious works. What I love about Mr. Bond’s writing is that you don’t feel that you should be of a certain age to enjoy it. So when I received a copy of “Secrets” – his latest collection of seven new short stories, I was only too eager to read and review them. The stories have the classic Bond touch – the description of a sleepy Dehra, the usual simple characters and a touch of quaintness, which is why I love reading what he writes. The stories in this book are set in the late 40’s – a time when India had just become an independent nation and Rusty was all of thirteen. His mother was a manager at a hotel called “Greens” at Dehra and he would stay there when visiting home from school on holidays. Times were tough and it wasn’t easy to make a living – amidst these circumstances, events started unfolding in and around the hotel, which form the crux of this book in the form of wonderfully told stories. We meet “The Skeleton in the Cupboard”, where as the title suggests a Skeleton is found in one of the rooms and the mystery around it is uncovered. “Gracie” on the other hand is a sentimental tale of a Dehra girl’s descent into something else altogether as she marries a British Army soldier and moves to London. “The Late Night Show” revolves around the murder of a man in a theatre during the late night show and of course Ruskin was present – watching the show when the murder took place. These three stories were my favourites, hence the mention. Not to say the other four are not worth it. It is just that these three appealed more to my senses. Ruskin Bond’s stories warm the heart and sometimes take you by surprise. They take your mind to a different time – a time when life was simpler and one did not have to think so much and but of course the credit goes to the way they are written. A must read. This entry was posted in Books, Fiction, indian fiction, penguin india, short stories and tagged Dehradun, Fiction, India, penguin india, ruskin bond, Secrets, short stories, Simla on September 25, 2011 by thehungryreader. Once again Mahasweta Devi has touched upon the lives of those who are never noticed, never cared for. And her pen cuts a deep wound in the minds of readers, forcing them to sit up and discern the essential from the inessential. Bedanabala. Her Life. Her Times is a touching tale told in first person of a woman, Bedanabala, whose mother used to live in a brothel. These reminiscences are sometimes personal, sometimes historical. The story begins in the late 19th Century, with the “theft” of a beautiful girl child from a wealthy family. She is Bedanabala’s mother. She grows up in the house of ill repute, to be groomed to enter the profession once she has come of age. But then, Did’ma, the owner of the brothel, grows to love this beautiful child as she would her own daughter and does not want her to enter this profession. She seeks for her a life of a householder. It is story that is seldom told. Did’ma’s contribution to the war effort, her donations to the fighters of India’s freedom and her gifts to the mission are her way of atoning for her sins. The story is set in a changing India, an India poised on the threshold of progress and transformation. New thoughts and ideas are forming in the minds of idealistic youth and nationalistic passion runs high. I like how she merges topics – nationalism with the issue of prostitution and yet none of them are glorified. She writes the way she imagines and the way she has known. There is not an ounce of superficialness in her penmanship skills. Mahasweta Devi’s Bedanabala. Her Life. Her Times empathises with a section of women that is misunderstood and disapproved of. She narrates the story with great sensitivity, skilfully weaving into the story a changing India and nationalism. I am a great fan of her works and that is only because she knows how to write and write well. The book is translated by Sunandini Banerjee. This entry was posted in Books, indian fiction, Literary Fiction, Review, Seagull Books, Translated Works and tagged Bedanabala, calcutta, indian fiction, Mahasweta Devi, Nationalism, prostitution, Seagull Books, translation on September 25, 2011 by thehungryreader.